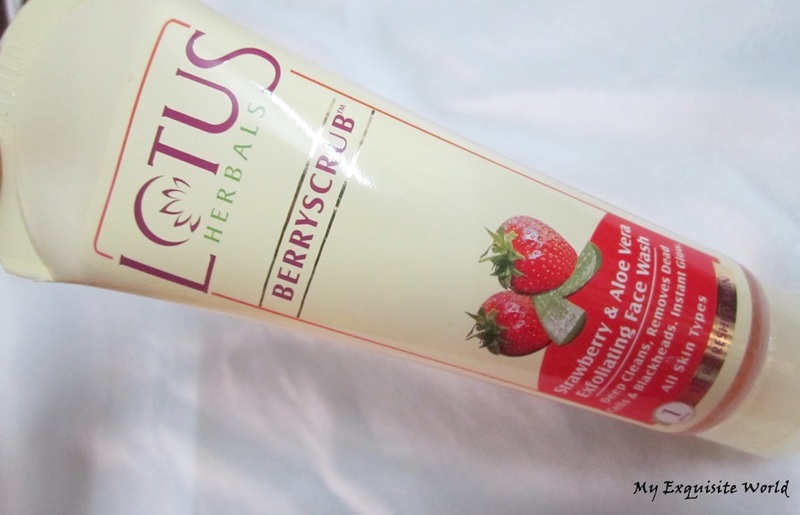 ABOUT:For skin that looks as great as it feels, try our BERRYSCRUB. The creamy lather cleanses and natural exfoliators polish your skin to reveal dazzling complexion. 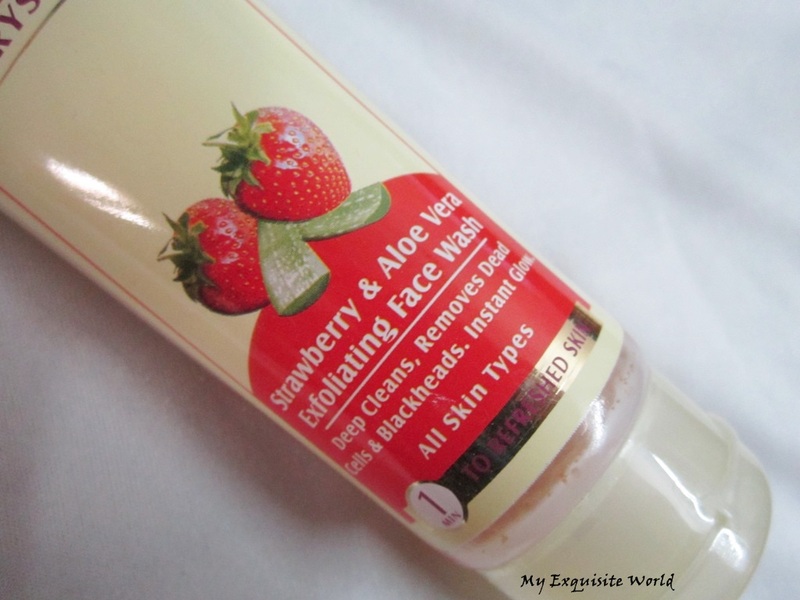 Strawberry Seeds: Exfoliating agent removes dead skin cells. Prevents formation of blackheads and gives instant glow. Aloe Vera: Excellent moisturising and skin healing properties, anti-inflammatory and soothing properties. Lemon Extract: Antioxidant, natural skin cleanser. Orange Peel Extract: Good antimicrobial and anti- inflammatory properties. 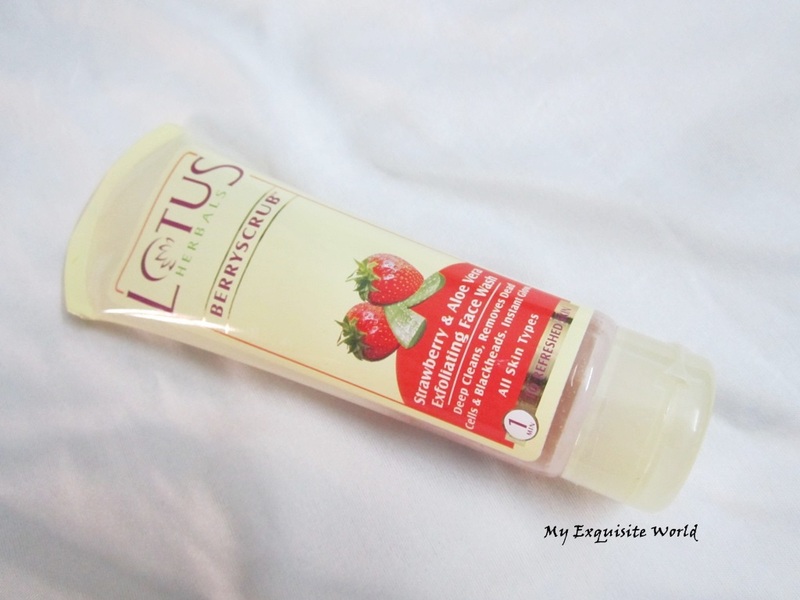 PACKAGING: Lotus Herbals Berryscrub comes in a soft press able plastic tube which is partially see-through. 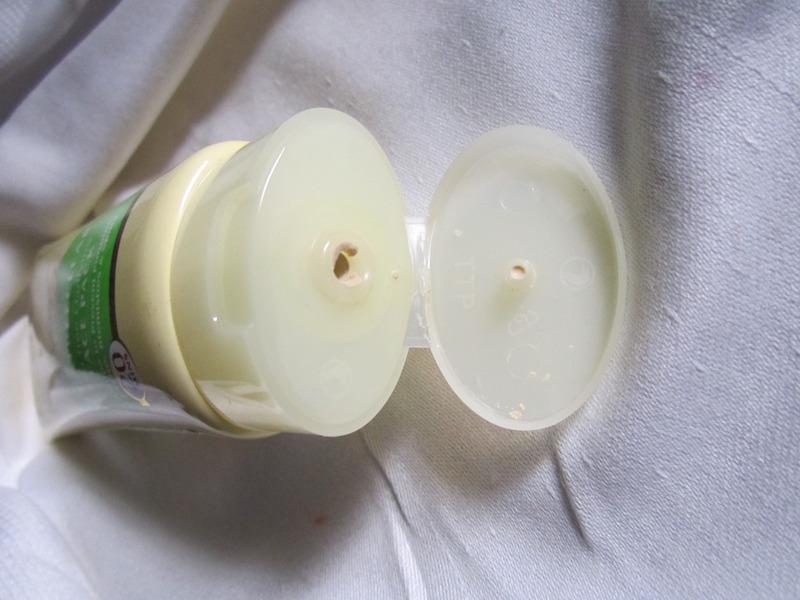 The tube has a flip cap with a hole for the product to run out. 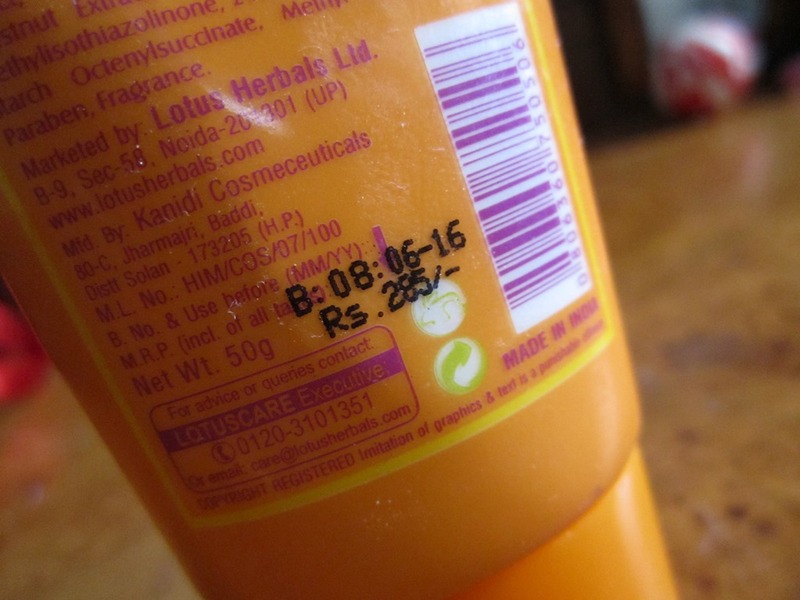 The details about the product and brand are printed on the top side of the tube body with an attractive shiny finish. 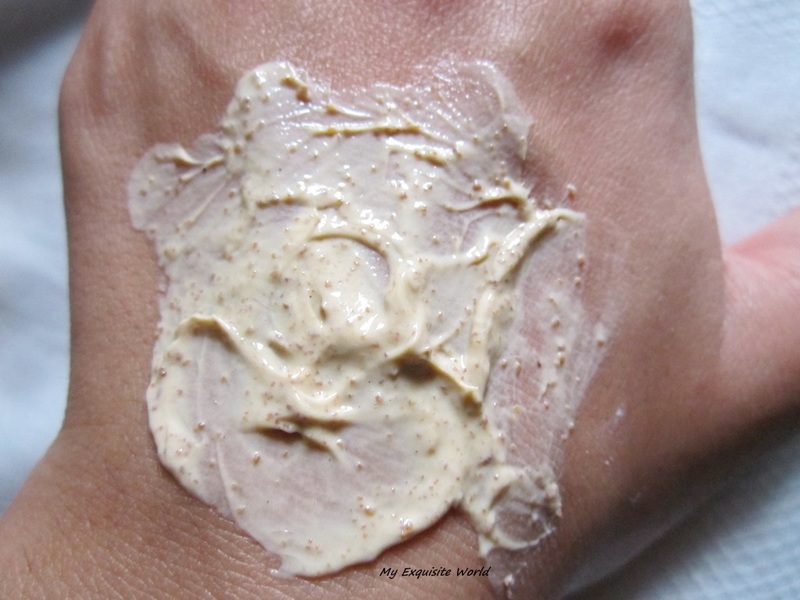 MY VIEWS: The texture of the scrub is smooth.It is quite runny in consistency and can easily spill.I find it quite runny.It should have been a little thick as I am not able to scrub the face easily.The presence of aloe vera makes it quite hydrating. 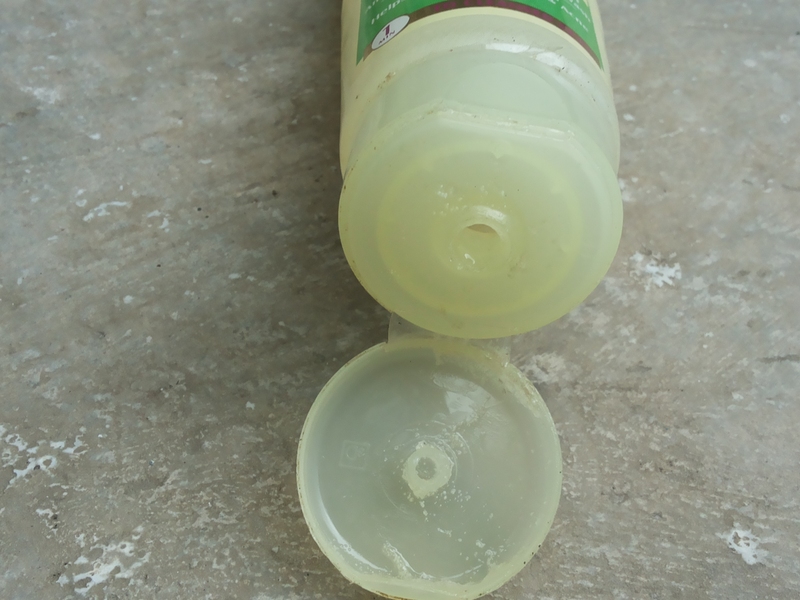 The color of the scrub product is transparent base with brown-orange mixed type of scrubbing particles. The base is like a gel. The fragrance of the scrub is quite weird.I thought it would have strawberry and aloe vera fragrance to it but I think it is some sour fragrance that I personally don’t like.The granules aren’t too harsh on skin.I feel that they should have put more granules to make the scrub more effective as it hardly works on scrubbing and removing blackheads and all.The scrub lathers well and my face feels fresh after wash but I can’t consider this as a scrub.It did not cause any break-outs. RECOMMENDATION:I don’t find it anywhere near to be called a scrub as it lacks the amount of granules needed for exfoliation.However,it is soothing and freshens up the face. I seldom use face wash. I am more of a scrub girl. But this face wash came on days when I was going through bad skin days. Use to hear this from mummy in childhood but it’s really true. If you skip meals or eat irregular it will show up on your face. So true. That’s what happened with me. I was going through mood swings and in this case the most victimized person is foods. So, it suffered. I was very irregular with my meals and thus my skin punished me. Got several bumps here and there. And that’s how this face wash came in my life. ABOUT:Specially formulated for oily skin, this absolute oil control face wash contains Tea Tree Oil, Cinnamon and Oak Bark extracts which remove excessive oil while regulating the Sebum (Oil) production in the skin. These special ingredients in this premium face wash decrease acne type lesions and combat free radicals leaving the skin fresh, clean and clearer. 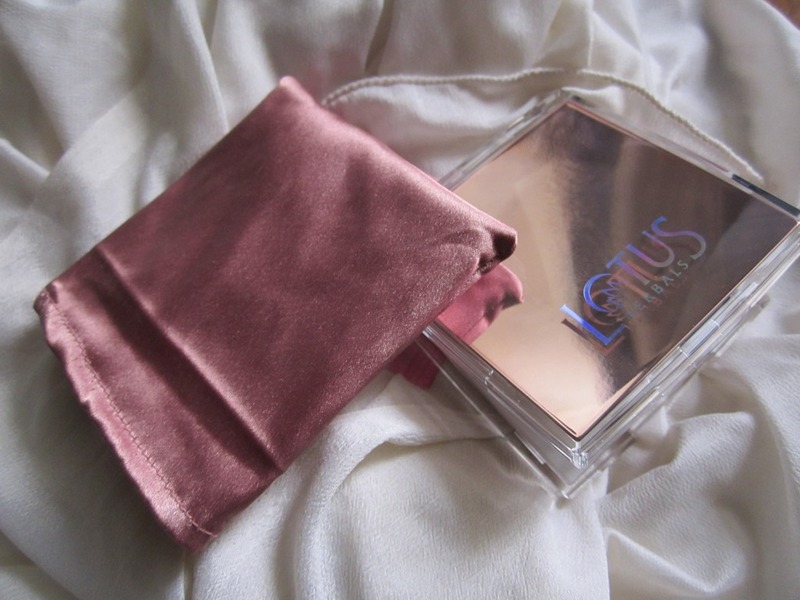 MY VIEWS:I love LOTUS for their fuss free packaging. Tube packaging is sometimes best. Easy to carry and use. This face wash also comes in tube packaging with medium in size. 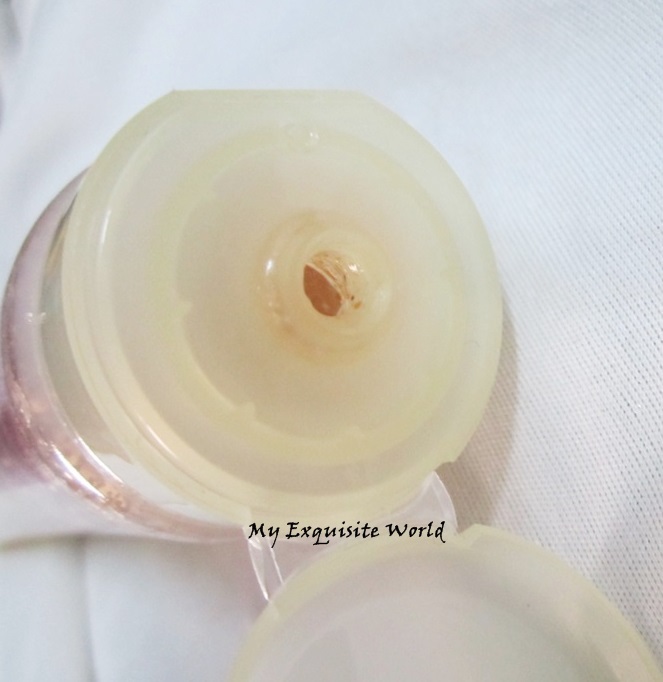 Once the flip top cap is shut the product does not dispenses out which makes it very easy for travel. 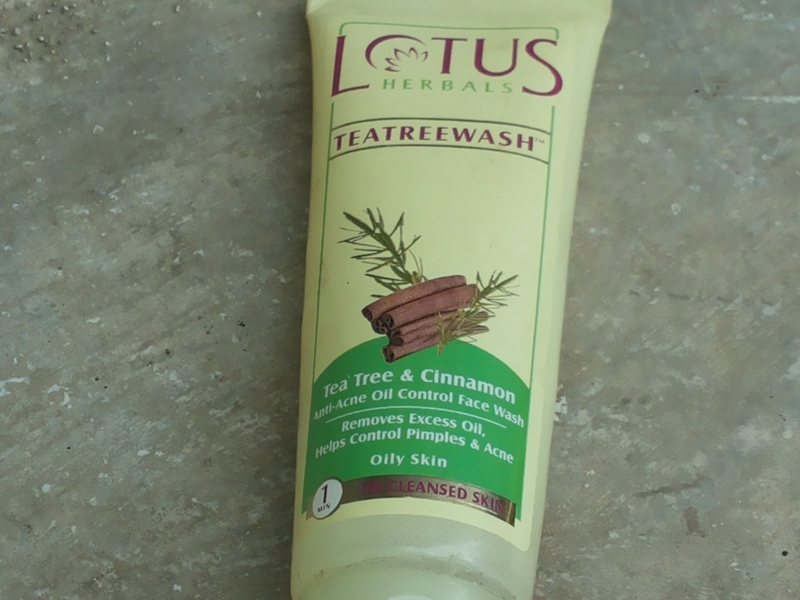 Lotus Tea Tree & Cinnamon Anti Acne Oil Control Face Wash is a colorless gel with runny consistency. 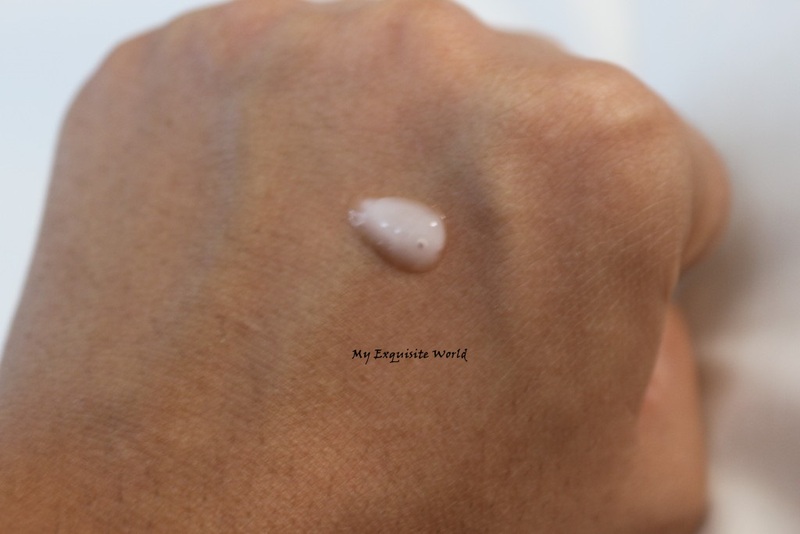 It has tiny white granules in it which are quite gentle on skin. The presence of mild granules makes it quite perfect for daily use. It does not lather much and the smell is not at all overpowering. I message my skin for about 3-5 minutes with this face wash after which I finally rinse off. You will immediately face a cooling and fresh sensation after you have rinsed your face. Also, it does not dries out face as most of the face washes. The cooling sensation prevents zits and pimples to further grow. It reduces the size of pimples with constant usage and ultimately they vanish within 3-4 days. Also, this face wash keeps oil secretion in check preventing any more breakouts. So, a must purchase from my side for all the oily and problematic skinned ladies. What impressed more is the ingredients list. It has the goodness of tea tree and cinnamon and oil bark extracts which are excellent in controlling oil which is the main reason for bad acnes and breakouts. The quantity is sufficient for 1.5-2 months usage. Not bad at this price…what say???? RECOMMENDATION:It is specifically designed for your bad skin days when most of the products don’t work or either overworks making it more problematic for you. So, this is a surely try from my side. 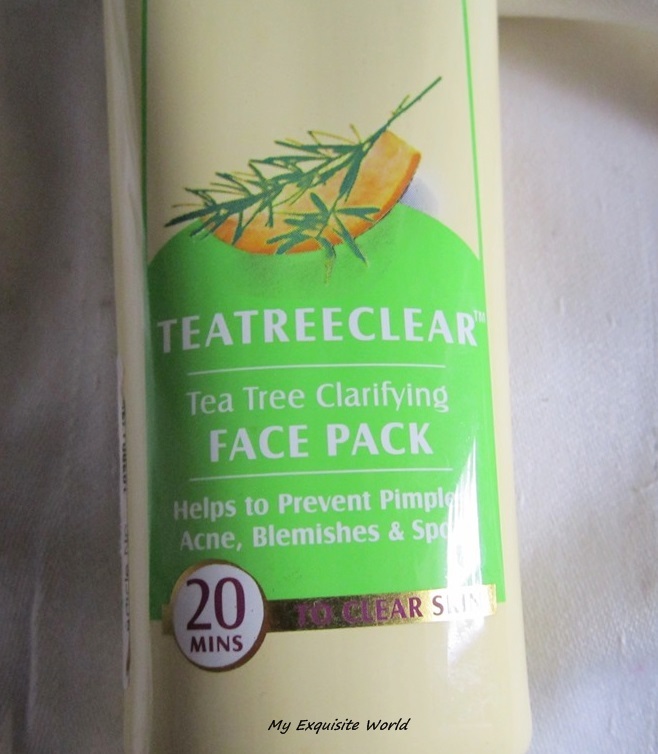 ABOUT:Regular use of this tea tree clarifying face pack helps get rid of pimples, acne blemishes and spots. 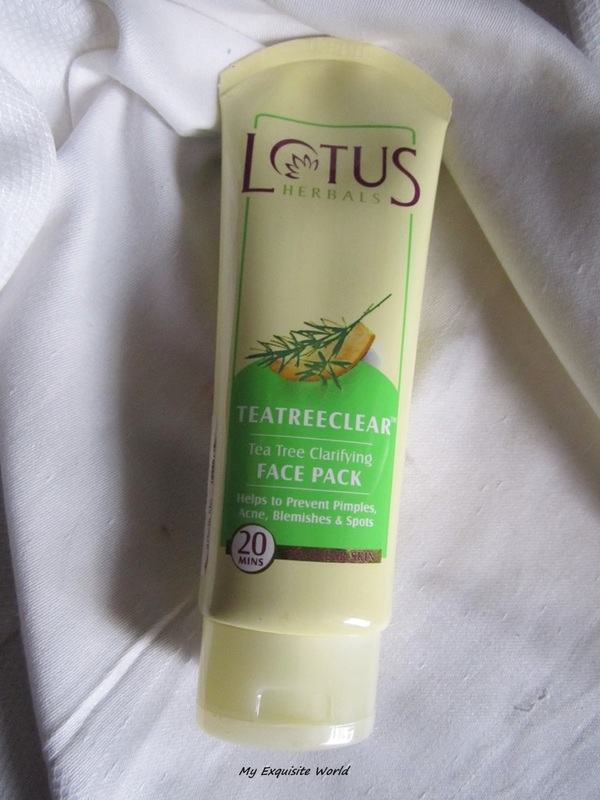 Clarifies facial complexion and enhances facial brightness. Tea Tree Oil- Anti-acne, Antimicrobial, Antioxidant. Petit Grain- Fights skin problems, blemishes & acne. Juniper-Antibacterial & anti-acne. Bergamot- Anti- microbial, useful for oily skin problems & prevents acne. How to Use: Apply a generous amount on face and neck leaving eyes. Relax till completely dry. Rinse with fresh water. PRICE: RS.275 for 120 gm. 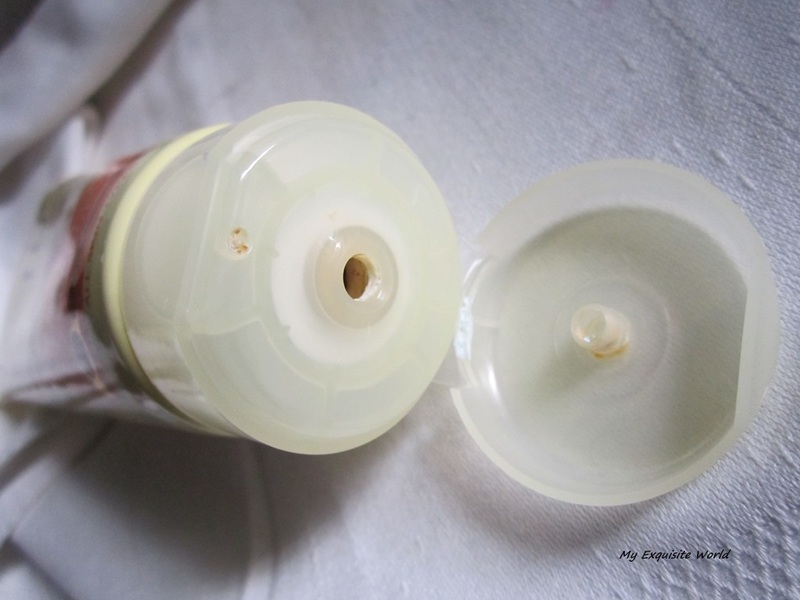 PACKAGING:The packaging is simple having a long tube.It has nozzle dispenser.The packaging is sturdy but the products accumulates at the mouth of the nozzle and dries up which has t be cleaned. 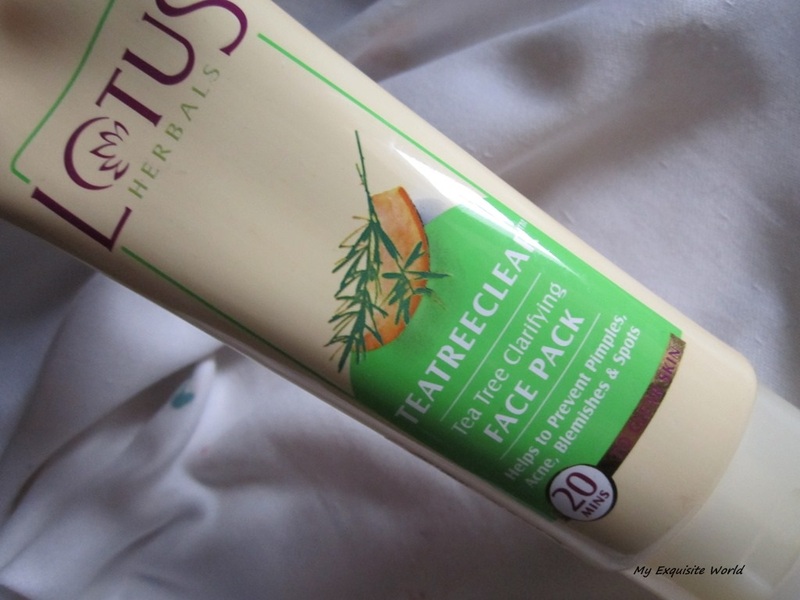 MY VIEWS:The pack has a thick creamy consistency.It has somewhat herbal-minty fragrance.It is easy to apply and spread all over the face.However,over application can make it a bit messy.I have noticed that whenever I apply this,I can feel it working on my acne as there is some sensation on face.It washes off well and leaves a clean,refreshed face behind. Whenever,I get and acne,I apply this and it does help in reducing the acnes.It removes extra oil from face and to some extent,it does control the oil secretion. RECOMMENDATION:I love this product as it actually works on acnes and is great for summers. ABOUT:As your hair and nails grow, your skin also grows. Upper skin cells become dead and new cells are developed underneath. It is necessary to remove these dead cells to reveal the younger, radiant skin from underneath. 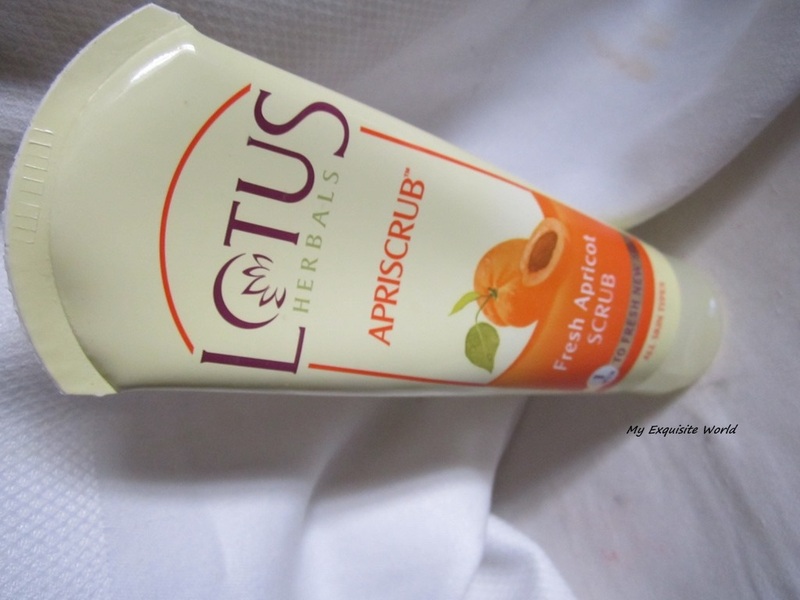 Lotus Herabls ApriScrub is the perfect scrub to scrub away these dead cells gently without rupturing your skin. A young, radiant skin is what you get after using this scrub. Direction for Use:- Moisten face & neck. 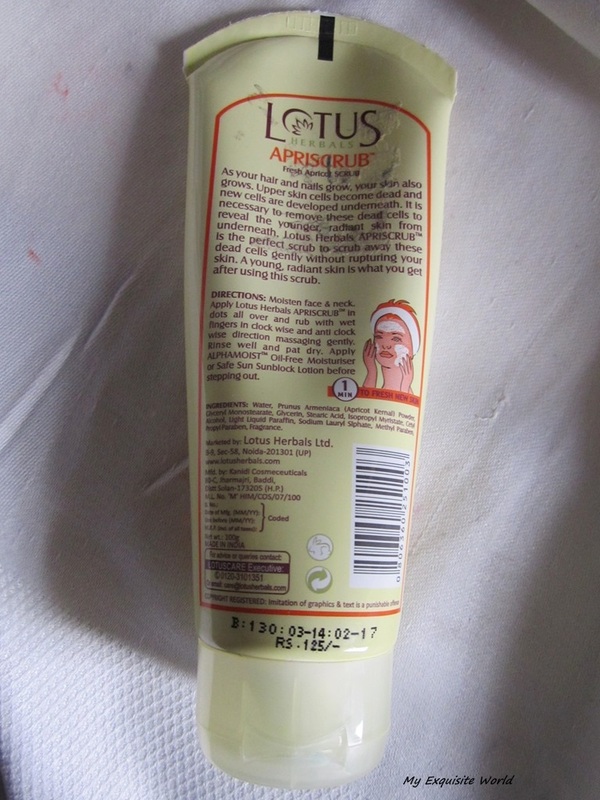 Apply Lotus Herbals Apriscrub in dots all over the face and rub with wet fingers in clock wise and anti-clockwise direction massaging gently. Rinse well and pat dry Apply ALPHAMOIST Oil free moisturizer Or Safe Sunblock Lotion before stepping out. PACKAGING: The scrub comes in an opaque plastic tube with a flip cap. 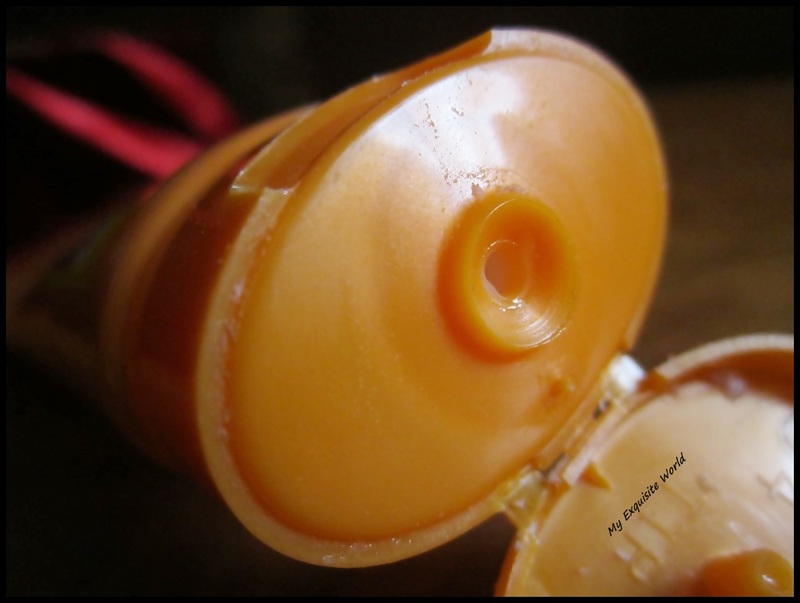 The tube is hygienic to use.It is sturdy and travel friendly.The mouth of the nozzle does get messy but it is easy to clean. 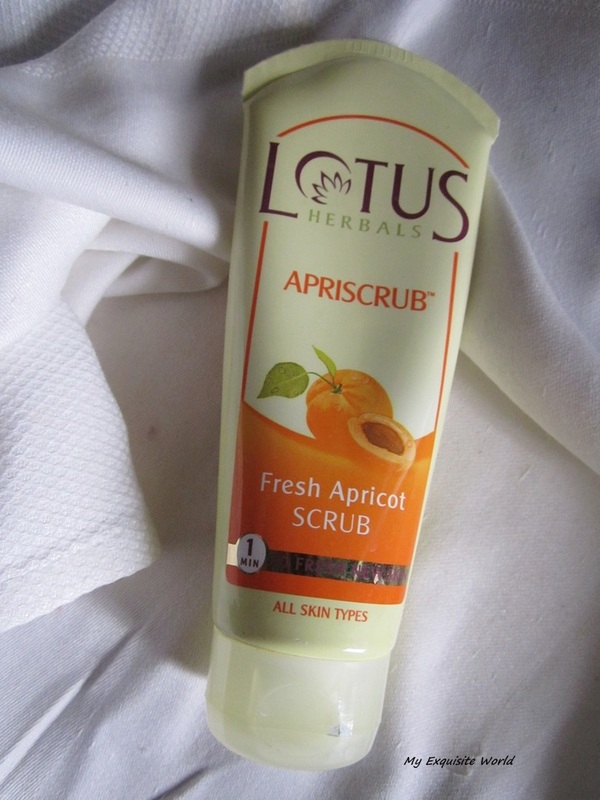 MY VIEWS: The scrub has a thick consistency .The apricot granules are not very harsh but can be felt on skin when used.However,on very sensitive skin,they can cause redness. I usually wet my face and then use the scrub in circular motion.This scrub is best for removing dead skin,dry skin and it does brighten up my face.It removes oil,dirt and clarifies my skin to a great extent.Bur regular usage of scrub should be avoided as they open up the pores.I mostly scrub 2-3 times a week. 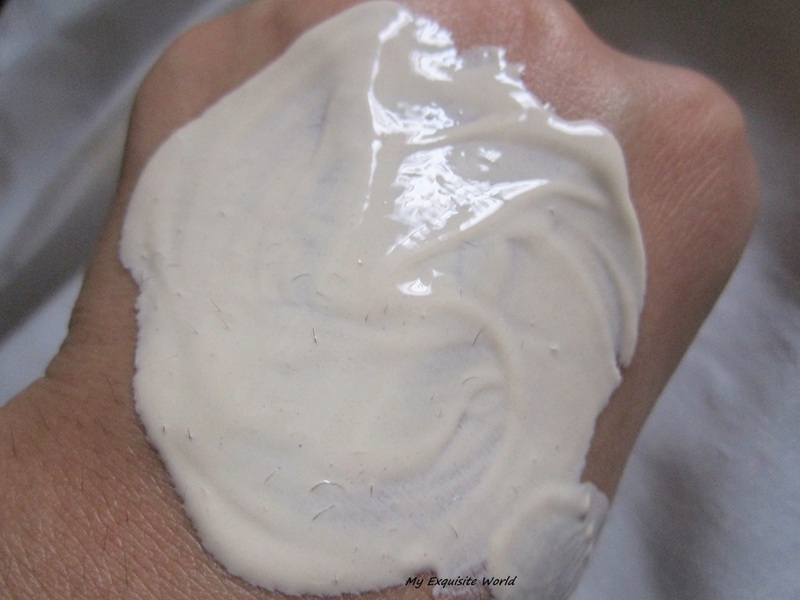 The creamy texture of the scrub imparts glow to face without causing any breakouts.My skin looks and feels very soft and supple.It has a very subtle fragrance that isn’t overpowering and has relaxing effect. 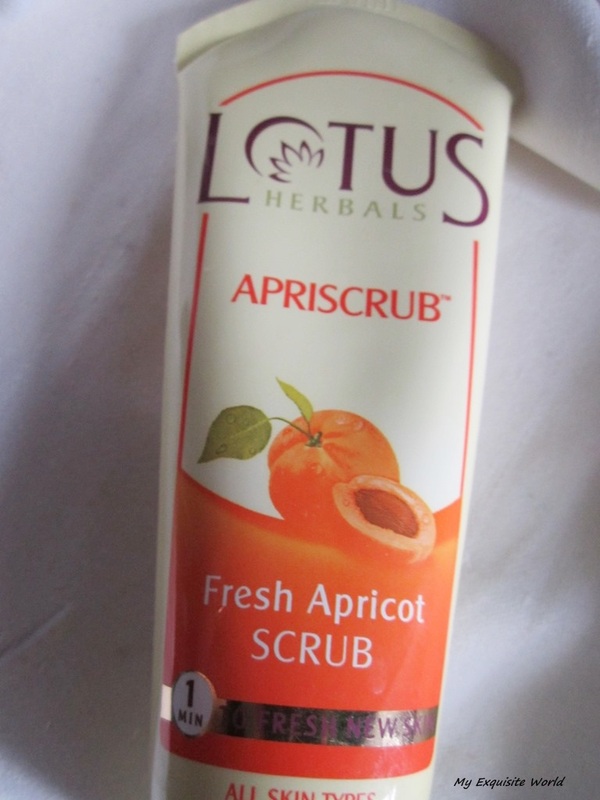 RECOMMENDATION:I love this scrub as it is reasonably priced and great for weekly usage.Do give it a try.It will suit all skin tones but one has to be careful on sensitive skin. 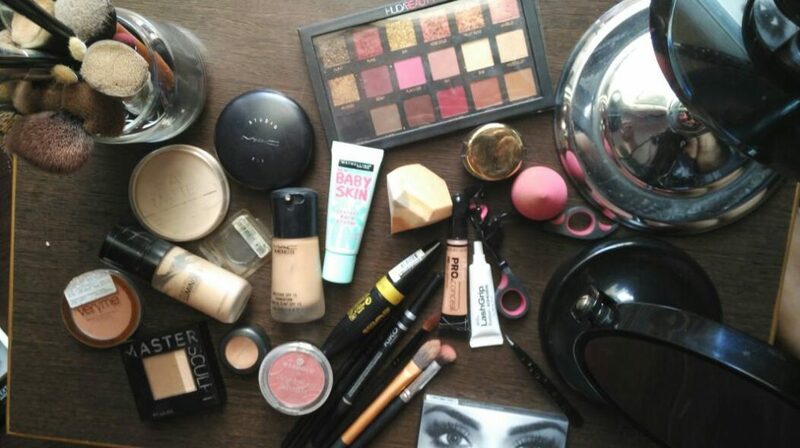 I have used Neutrogena,lakme ,Vichy Sunscreens. 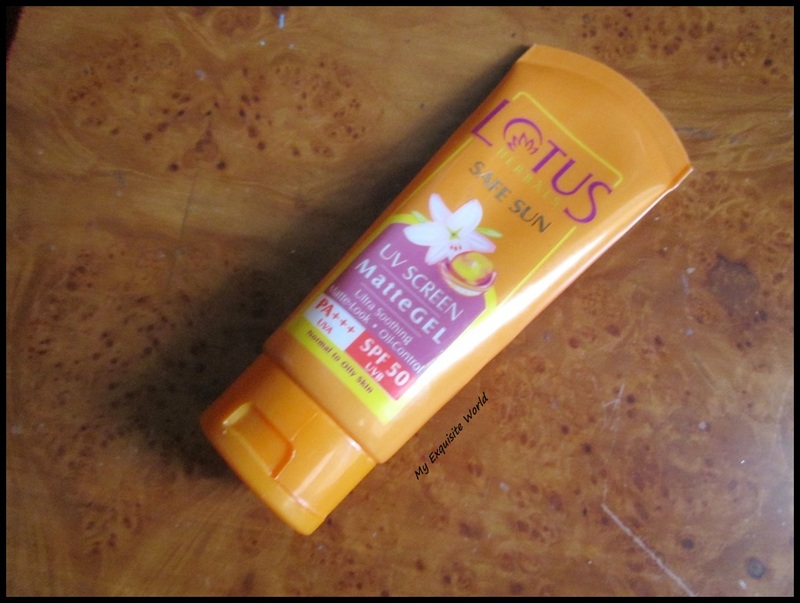 Lakme one did not suit me even a bit.Neutrogena and Vichy were good but ever since I started using this, Lotus Matte sunscreen,it has been my most favorite!!! ABOUT:An innovative sunblock which is totally non oily and provides a fresh and clean finish to the face , neck and hands. It protects against all forms of sun induced damage: skin tan, sun burn, pre-mature ageing and skin cancer. 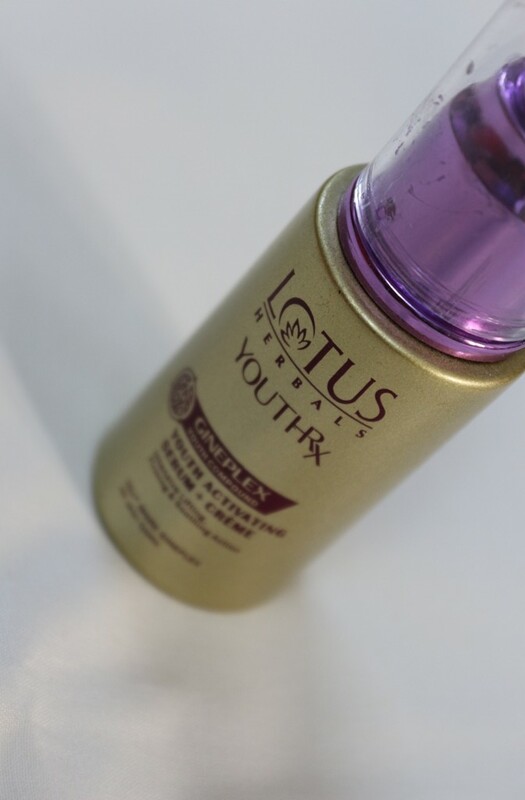 Contains extracts horse chestnut, comfrey and vanilla. 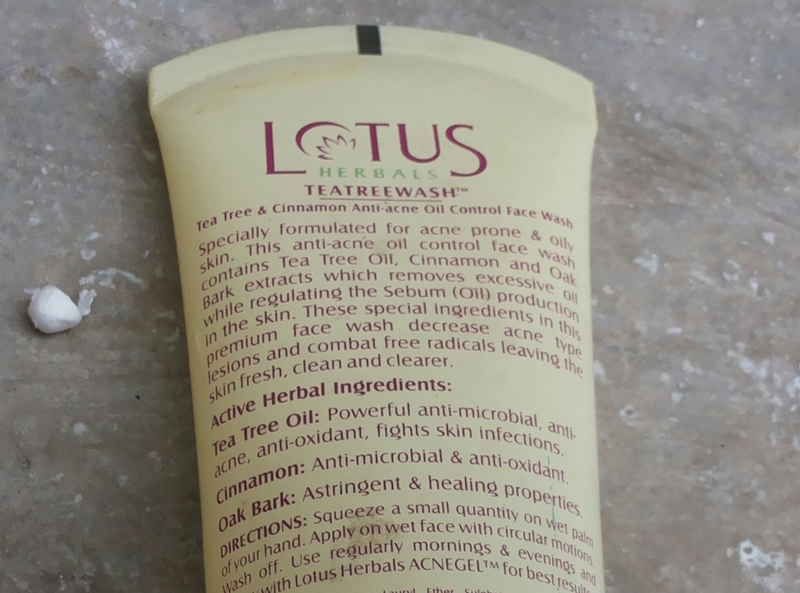 DIRECTIONS TO APPLY:Apply Lotus Herbals Safe Sun UV Screen Matte Gel PA+++ SPF 50 on your face and neck and other exposed areas of your skin and rub smoothly for a minute so that it gets absorbed into the skin thoroughly. Apply 15-20 minutes before your skin getting exposed to the environmental harmful rays and pollutants. 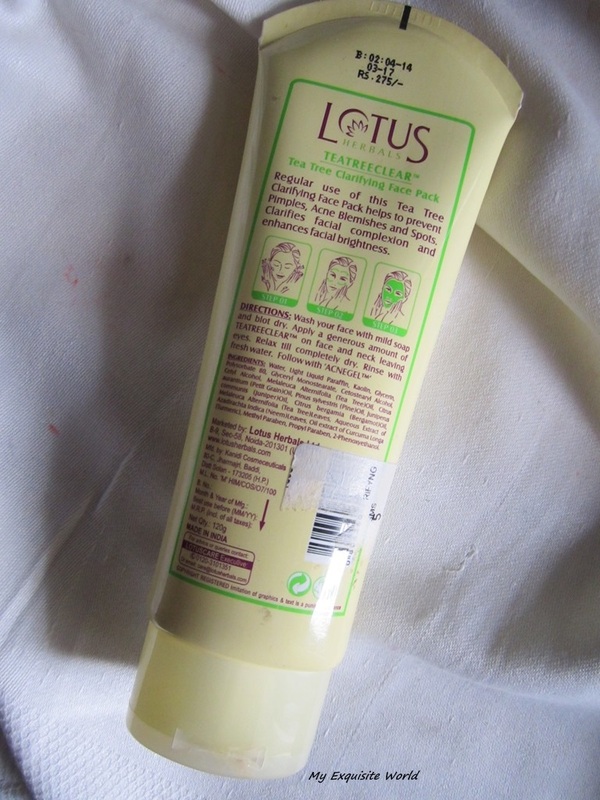 PACKAGING:The packaging is like other Lotus products having an orange outer cover which is a squeeze bottle with flap.It is travel friendly and easy to store.However,the mouth of the whole gets messy and has to be cleaned up. 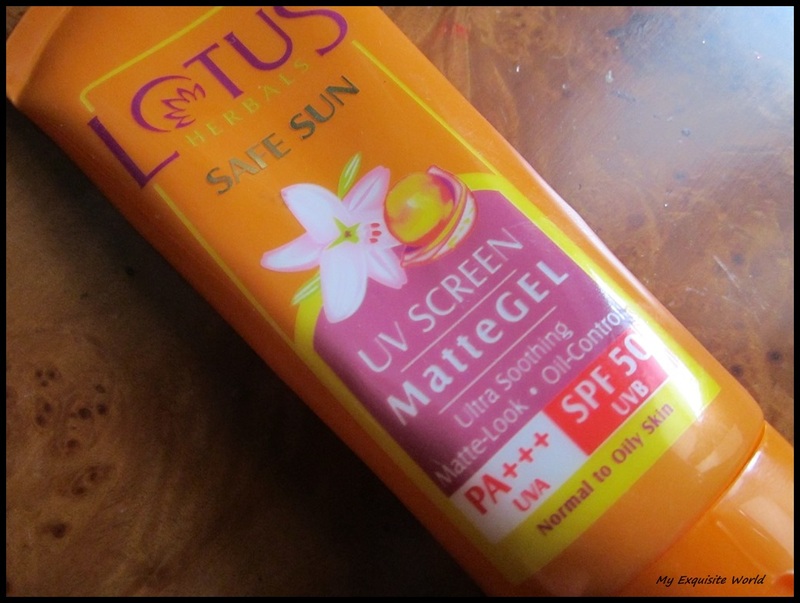 MY VIEWS:This sunscreen has become my HG skin care products as well as HG sunscreen.I am a person who doesn’t like applying sunscreen because they make my skin look greasy and dull.But,this is one sunscreen that I love applying.It is so easy to apply and makes my skin supple and soft.It makes my face fresh and bright.I have combination skin tone and my T-zone is oily but when I apply this,it gives a matte look to my face.Also,it is great for using under direct sun as it has high spf. This sunscreen did not cause me any break out.My face looks matte and a compact over it fixes everything.However,one thing I would like to point out. During humid climate,if sometimes,I itch n my face,the sunscreen peels a bit which I totally dislike but that obvious as it is gel based and even slight rubbing will result in peeling though this sunscreen gets absorbed easily. RECOMMENDATION:I highly recommend this sunscreen.It is affordable and a great product!!! 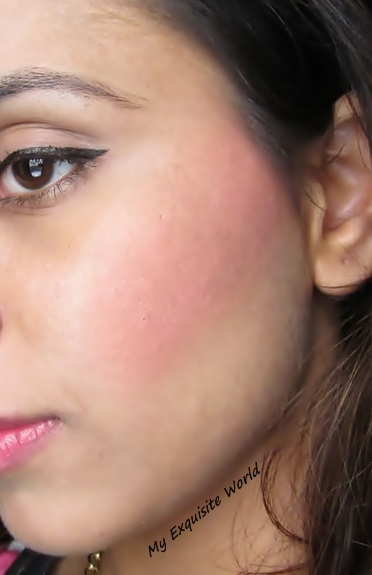 Fall is here and its time to perk out our flushed cheeks.I love blushes and this shade is a must have for all.Lotus Herbals launched 4 shades int he purestay range and I picked up 2.Lets have a look at one of them!! 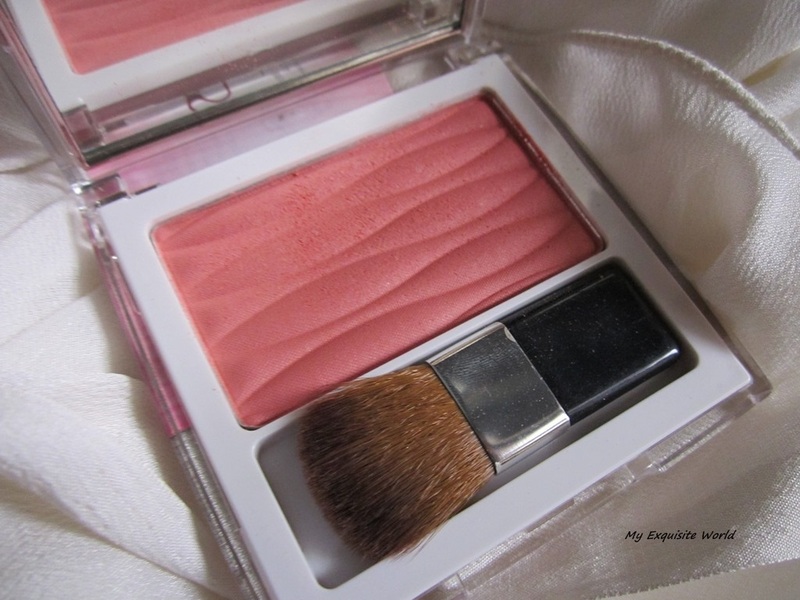 ABOUT:PURESTAY Blush is a preservative free all day wear blusher that gives cheeks a radiant, sheer and natural glow. 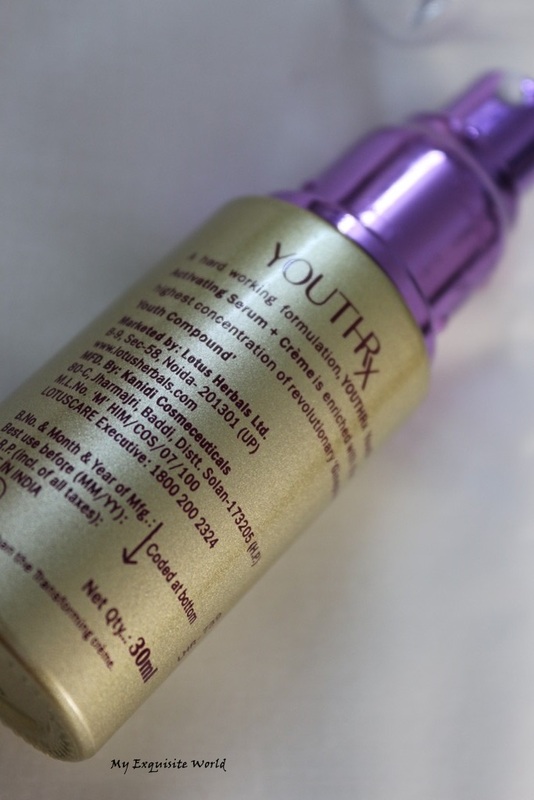 This silky long wearing formula delivers pure, super smooth texture, excellent pigmentation. Colors are suitable for Indian skin tones. 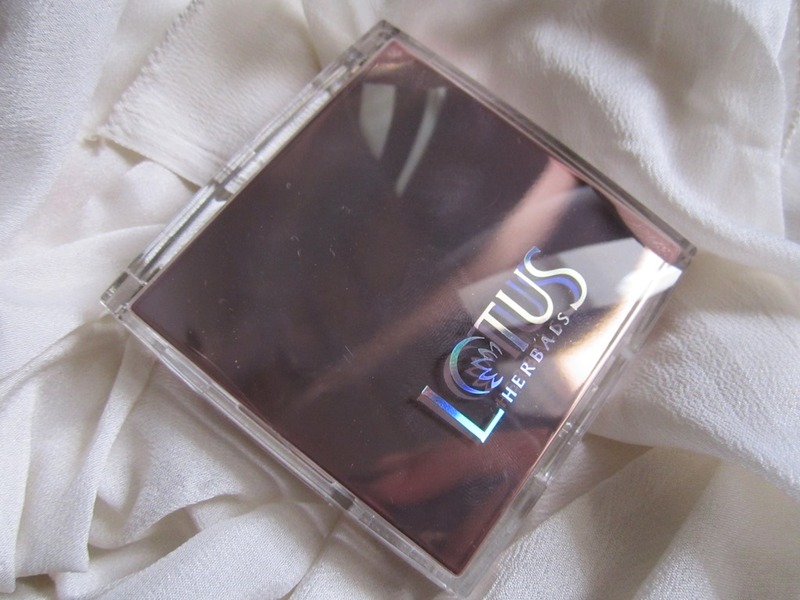 PACKAGING:The packaging is really attractive and feels heavy.lotus Herbals have definitely put a lot of thought in presentation of the blushes and the entire purestay range.The blush have a square packaging having pink colour.it is strudy.It has mirror at one side and blush with small applicator at the other side. 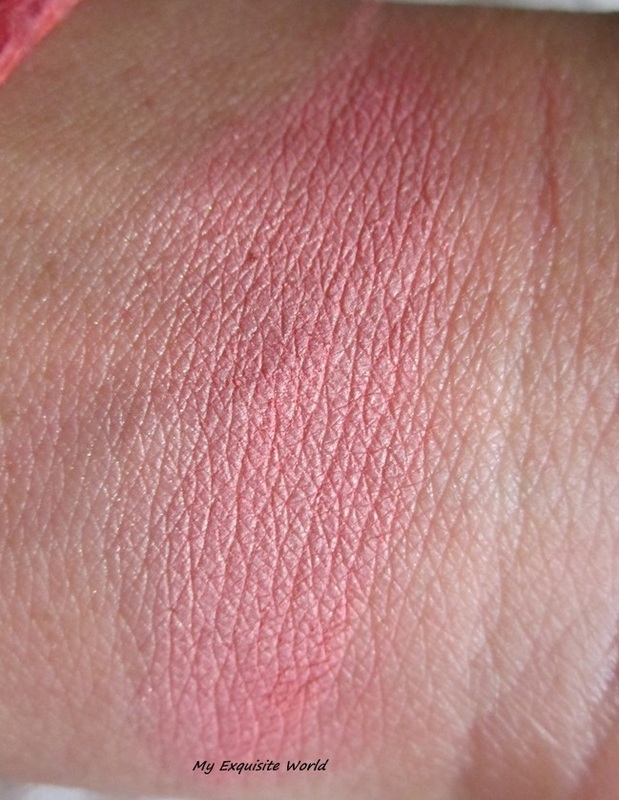 SHADE:Pink Petal is a light pink with very little peach tones in it.It has minute shimmer which is non-gritty.Th shade is great for all skin tones. 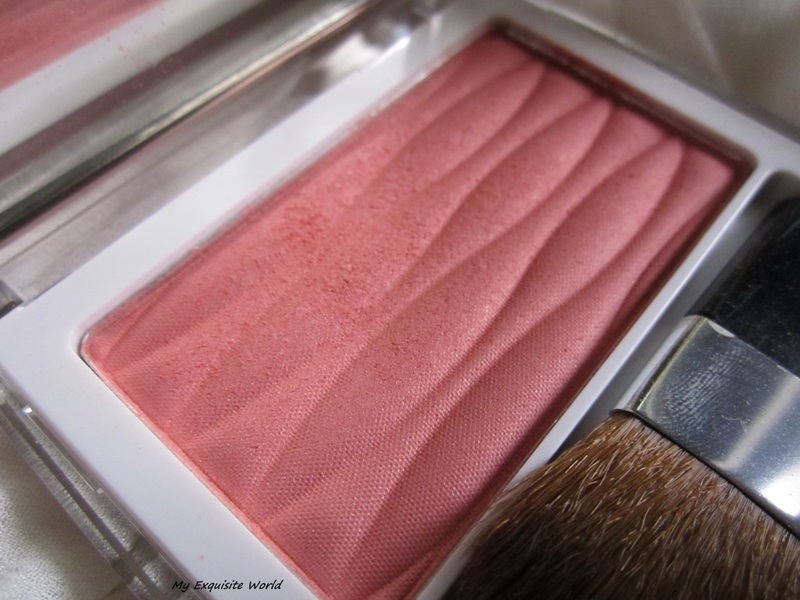 MY VIEWS:The texture of the blush is smooth and non-gritty.It is soft but a bit hard to swipe. 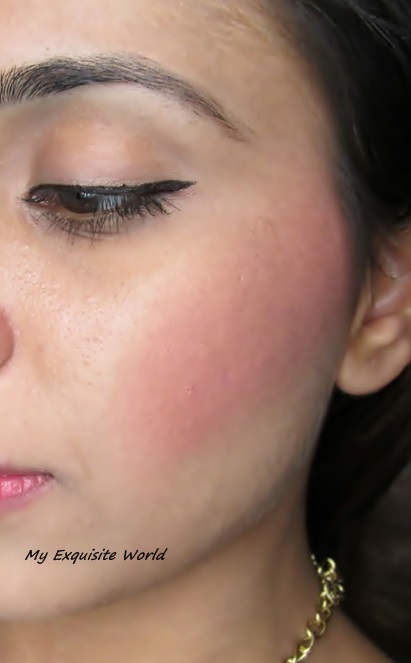 Also,there is a bit of fallout on swiping but its transforms beautifully on cheeks.The blush blends easily and the shimmer doesn’t look OTT.It stays for about 5-6 hours.It doesnt look patchy and didn’t break me out. RECOMMENDATION:The formula is great.It stays for decent amount of time and I live the shade and the packaging.Check out other shades as well.Hihgly recommended! !